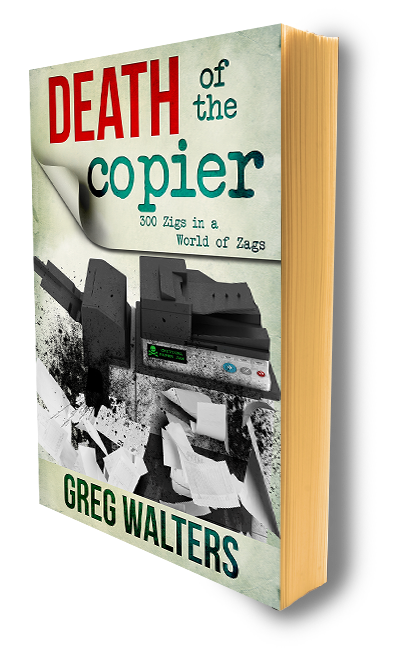 Greg Walters is a well-known a blogger, rebel, truth seeker, and now a consultant in the managed services field for print and IT. This article focuses on his leadership and—at times—exasperating experiences in building an MPS practice inside a large West Coast VAR. Adding managed print services (MPS) was an uneasy fit that didn’t demonstrate its value until after Walters took over. As the MPS practice grew more than $1 million, the plan shifted and the practice was folded into the much larger managed services group to leverage common processes and resources. It is an open question whether the MPS practice will retain its edgy personality and strong growth rate as it goes mainstream as part of the VAR services portfolio. Greg Walters took over the immature managed print services practice at SIGMAnet (the VAR) in January 2010. It was a very chaotic period, when the business was dealing with the collapse of the financial giants and the loss of two key customers, Countrywide and IndyMac. This forced a major restructuring of the business and loss of personnel. Walters felt lucky to still have a job when SIGMAnet’s owner gave him the ultimatum “to either show me how this practice can make money in the next 30 days or shut it down.” The gauntlet had been laid down. Walters joined SIGMAnet from IKON in 2007 as an MPS specialist and to support the new HP Edgeline product line. The new MPS practice experienced start-up problems and was slow at ramping up revenue for the first several years. After personnel cuts, by early 2010 Walters was the only member left in the MPS practice. This quickly became a very personal challenge. It was an unexpected opportunity, but Walters was ready for it. He instinctively knew what to do based on his experience and training. He got cash flow moving, reset customer expectations, and began to work furiously to restart the MPS practice. It was 30 days of insane activity. He got the job done and put the MPS practice on a positive path, but the process left a trail of broken glass. With the business in jeopardy, he did what he felt was necessary to improve sales and cash flow. When the warehouse was holding up a large shipment ($150,000 of products and consumables) he aggressively escalated the issue and forced the products to be released. This upset the executive team. The VAR side of the business didn’t understand MPS and wasn’t sure what to make of this upstart practice leader. lower recurring revenue at a GP greater than 40 percent for an MPS contract. The difference in profit to the bottom line was astounding. This, combined with a demonstrated improvement in cash flow over several months, convinced the owner that this business was worthy of attention. A key obstacle to restarting MPS sales was overcoming the internal resistance of the sales team—the business development managers (BDMs). The previous MPS sales professionals had old-school copier backgrounds that didn’t fit well in a relationship-based, consultative sales environment. “They didn’t listen, and pushed product,” says Walters, and this greatly irritated customers. The MPS group had been kicked off of more than one account because of these tactics, and the BDMs saw its members as a liability and wanted little to do with them. It took special care and handling by Walters to convince the BDMs that the new MPS team was different and could have a positive impact on the customer base. He worked one-on-one with the top sales leaders to turn around their thinking. Over time, Walters proved that he had the capability to drive the business forward. He rebuilt customer relationships, drove billings, and delivered results that demonstrated the value of MPS to the business. The owner developed confidence in this previously unproven practice and personally introduced Walters to the rest of the executive team. The greater challenge of getting the MPS practice accepted as an equal part of the VAR business was yet to play out. The MPS practice, although profitable for the first time in 2010, was a small part of the VAR’s business. Annual revenue had more than doubled, and page volume per device was relatively high, at more than 2,900 pages per month. The Edgelines pumped out a lot of volume. The practice had its own P&L because of its unusual business model, which captured the growth and profitability results. The strong revenue growth, shown in Figure 1, is remarkable and was driven by Walters’ sales leadership. MPS sales were built on net new customers who did not have a prior relationship with the VAR. The five-year growth pattern is not unusual and is similar to that of other large VARs, like Compugen, which also had a long latency period prior to substantial growth. In this case, it took a dramatic change in leadership to realize the potential business impact of MPS. The steep sales growth continued in 2011. The additional volume was partly a result of cross-selling MPS into existing VAR accounts. MPS success inside the VAR was not defined so much by the strong revenue growth, but rather by the exceptional profitability that added double-digit net margin to the bottom line. The exceptional profitability of MPS did contribute a surprising level of gross profit (GP). This undoubtedly caught management’s attention. Infrastructure sales also contributed to the bottom line through marketing development funds and back-end rebates. The impact of MPS on the business was especially important when considering long-term trends of shrinking equipment margins. The growing financial impact of MPS on the VAR’s business drove the need for integration of the print services business. However, MPS presented significant challenges to the convergence of processes and systems because of the unique business model, sales approach, and IT management tools it uses to track and report business results. Photizo Group first discussed the notion of MPS/managed IT services convergence in 2010. The MPS adoption model was changed to include Stage 4 (S4) convergence. This model reflected how the market was already beginning to change. The VAR’s goals in 2011 were to integrate MPS with the much larger managed services practice group that included an NOC system-monitoring and reporting service, help desk, unified communications, staff augmentation, mobility, and MPS. The objective of the model is to drive internal efficiencies by leveraging common processes and resources. Sales: Common services talk track by BDMs, part of services portfolio, supported by specialists for each practice area, including MPS. The downside is that there are no MPS-specific commission goals or gates and there is currently no MPS specialist. NOC: Common process for remote network monitoring and management, expanded to include PrintSolv™ screen for printer/copier issues and alerts. Dispatch: Common service for directing service technician activity for PCs and printers; most accounts’ repairs for PCs and workstations are optional, whereas printer issues involve on-site technician activity; loss of one MPS trained person. Help desk: Common process to handle end-user issues, depending on account SLAs and contract. Conduct low-level triage and, if needed, engage service. Service: Printer technicians are cross-trained for on-site PC/network diagnosis and inspection; however, the converse is not true. Back-office systems: Contracts and billing are still separate for now. There is currently no customer satisfaction measurement or process in place. The advantage of an integrated approach (i.e., common processes and shared resources) is higher technician utilization, staff consolidation, and related cost improvements. More subtly, the objective of such an approach is to provide the customer with a more efficient service response with fewer handoffs, which results in easier, faster, more complete service across the organization. Also, the VAR has reduced the chance for competitors to directly engage with the customer for printer management. The disadvantages of this approach include pressure on the VAR to retain trained and qualified printer staff and technicians to assure competent delivery of services. The differences between the business model and sales approach also have to be thoroughly understood across the management team. This can result in a loss of customer satisfaction for a large account where printer management is a small part. Walters deserves much credit for creating a viable and highly profitable MPS practice inside a large VAR. This practice has developed largely in isolation from the rest of the VAR’s business because management has been hesitant to recognize the value MPS has brought to its customers and to the business. This is the environment that Walters thrived in while driving a small team to deliver strong revenue growth and excellent customer service. It is an amazing turnaround from the chaotic period of business restructuring, when MPS was on the ropes. The VAR has begun integrating MPS with the rest of its services portfolio. This includes a common sales talk tract, remote monitoring through the NOC, and other common processes and shared resources. However, the question remains open regarding how far to go. There are still no sales goals or gates for driving MPS, which is different from all other services. Although the S4 convergence is largely complete, it is too early to call it a success. Too many parts are in motion. The value of the MPS practice to the business must be decided, and if it is to be sustained it must be given a full place at the table in terms of sales goals, objectives, and the resources to support it fully.